If you have a Bigpond email account, you might be impacted by a recent change that has been rolled out. If you stop getting emails suddenly, (Late July 2016) then you may be part of a group who’s mailboxes with Telstra require a change to the mail server settings from where you access your email from a Mobile Device, Outlook or similar mail software. Yesterday I went to a client who had another outage from their cable service provider. Telstra. A great deal of their work is done online and when the service is running, the speed is great. This weeks outage started 28 July and was reported to be down until Thursday evening 4 August 2016!! Currently reporting to be back around 7pm. See image below for the 2030 post code. How can a businesses continue to operate with this happening on a regular basis. 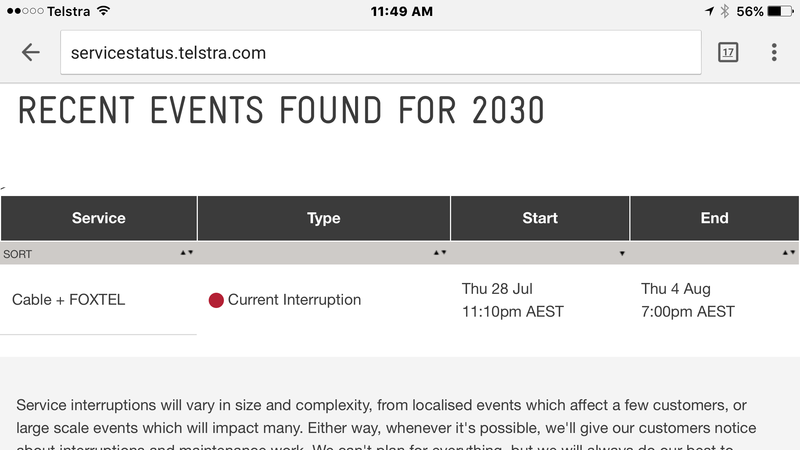 Chasing Telstra is a very frustrating activity and most often does not result in a timely solution. You just have to wait for them to take action while in the interim rack up huge costs and stress!! All if not most roads lead to Telstra so you don’t have many choices. Some ISP’s have great support while others have better speed. What do you choose? Exeter I am told have great customer service but iinet have better speed. Internode used to be top of the pile for customer service but much to my dismay, this is no longer the case. I used to be with internode for over 9 years and had no issues. Support was great. When I relocated 5 years ago, I was forced to change my ISP. I went with TPG. Yes not always the greatest, but good enough. Unlimited download plan, bundled with my home phone and unlimited cams to landlines and mobiles for $69.99. My speed on a good day is around 11-13mbps which is ok.
Tell me what you are experiencing at the moment and who your internet service is through. Is your internet Speed not fast enough? Everyone complaining in the home or office? You can get an indication of your speed by going to http://www.speedtest.net website where you can Test your internet download and upload speed. Once the website comes up, click the Begin Test button. The image above shows a relatively slow internet speed for ADSL2+ How do you interpret the numbers? The Download Mbps. This must be as high as possible. Depending on the service you are signed up with ADSL or Cable, these numbers will vary greatly. These numbers may change from one minute to the next depending on a number of things. Are you testing via a WiFi connection or are you connected with a cable. Internet speed is not always determined by your connection speed, but also by the computers/Servers you are connecting to and their speed. If they are very slow or congested, then you will be impacted by this. The Upload Mbps is normally slower (0.85 Mbps) than the download unless you have a upmarket plan which provides high upload connectivity. Uploads are things like sending emails or uploading files or using services like Dropbox, Google Drive, One Drive etc. When uploading occurs this will also impact the download speed, so if you have a lot of data to upload, try do it out of normal working hours as this will impact the regular use of the internet. Standard Cable Services can get around 35 Mbps download and around 2-2.5Mbps upload. This is obtainable from Telstra or Optus and they provide the modems. Elite Cable services from both Telstra and Optus offer a higher speed service which gets close to the 100 Mbps speed. If your speed appears to be slower than what you would expect or has noticeably slowed down, then I would suggest contacting your ISP and asking them if there is something that they can do to address the speed issue. Sometimes if you are on a old plan or setup, then you can get a speed boost by them changing settings on their end.